Do you like buying your toilet paper in 500-roll cases, rather than a few rolls at a time? If so, then you’ll love this page: It lists every article ever posted on Gnome Stew, in alphabetical order. Since we’ve been posting articles since May 12, 2008, it should take you approximately a billion years to read the whole site. Hope you have some spare time! 2006 on Treasure Tables: Thank You! 72 Links for GMs, and the GMing Q&A Forum is Here to Stay! Add a Touch of Original Game Theory to Spice Up Your RPG! All Future Posts Will be About F.A.T.A.L. All Grown Up, and Still Gaming! Announcing Gnome Stew’s Second Book: Masks! Another YMIAT Contest: A World Without D&D? Are you gaming, narrating, or simulating? Are you playing D&D 5e? Excited by Pathfinder Core? Are You the Most Dialed-in Gamer in Your Group? At Origins? Please vote for Never Unprepared! Black Friday/Cyber Monday Sale: Get Eureka for 29% Off! But We Don’t Want to Learn a New System! Calling All Readers–What Non-Gaming Items are Great Gifts for GMs? Can Old RPG Standbys Still Amaze? Combat as a Single Test? Congratulations to Gold ENnie Winner DungeonMastering.com! Congratulations, 2009 ENnie Award Nominees! Connect the dots and get to work! Convention GMing on the Mind: Linear or Loose? D&D Burgoo (3.5): Don’tcha got a job, or something? D&D Burgoo (3.5): Harpies have bad B.O. D&D Burgoo (3.5): It’s time to panic. We don’t have a cleric. D&D Burgoo (4.0): A Howling Success? D&D 5th Edition Preview: Really, Wizards? Really?! Dicing With Dragons: What Next? Do PCs Dream of Dire Sheep? Do You Buy Published Adventures? Do You Do It Alone Or In A Group? Do You Do Things as a GM That You Would Hate as a Player? Do You Give Bonuses/Penalties to Skill Checks for Roleplaying? Do You Have Any Cake, Instead? Do You Limit Character Options? Do You Prep NPC Dialogue? Do You Use a GM Binder? Do You Use a GM’s Screen? Does Age Matter in Gaming? Does Your Group Have a Meta? Does Your Group Pool Funds for Gaming Books? Dresden Files: Werewolves and Harpies, oh my! ENnie Award Voting is Now Open — Please Vote for Gnome Stew and Masks! Eureka Has Been Nominated for a Golden Geek Award – Please Vote for Us! Eureka Sample #4: Art, Baby! Eureka Sample #5: Horror Plots — and Preorders Open June 28th! Fail? Can the world survive failure? Fair or Foul: If You Giveth, Can You Taketh Away? Fair or Foul: Learning the Hard Way? Fair or Foul: Restricting Roleplay? Focal Point Preorders Open July 7 — Want a 19-Page Preview PDF? Forget Your First RPG — What Was Your First Setting as a GM? 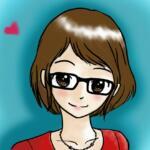 Forum Roundup: GM-friendly RPGs, Contest and D&D: Broken or Not? Free Standees from Gnome Stew to You! Fun Historical Games, Fact or Fiction? Game Balance or Catering to the Players? Game Master, Referee, Storyteller: What’s in a Name? Games Within Games: Fun or Distracting? Gaming Books that Offer Unexpectedly Good GMing Advice? Gaming Sessions: What’s Ideal, What’s Too Short? Garage Sale 2016 Everything Must Go! Garage Sale 2017, It’s All Priced To Move! GM Workouts: Gimme Some Reps! GM, Thou Art Not A Game Designer! GMing concept garage sale. Everything must go! GMing concept garage sale. Everything STILL must go! Gming Easy Mode: Ocean Explorers! GMing Milestones: How Many Are There? GMing Screens: What Are They Good For? GMing: Art, Craft or Science? Gnome Rodeo: Did You Know All Gnomes Wear Cufflinks? 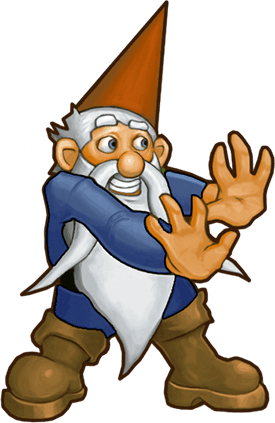 Gnome Rodeo: Nifty Links, Plus: Want to Make Money in the RPG Industry? Gnome Rodeo: Pardon Me, But Do You Have Any GMing Links? Gnome Stew and Masks Took Home Two Golds at the 2012 ENnie Awards! THANK YOU! Gnome Stew is Five Years Old Today: Thank You, Readers! Gnome Stew is Nominated for a 2012 Site of the Year Award! Gnome Stew is the 2013 RPG Site of the Year — Thank You! Gnome Stew Takes Silver for Best Blog in the 2010 ENnie Awards! 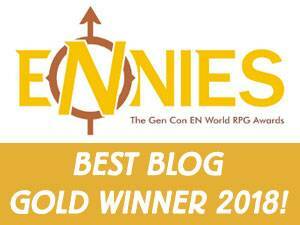 Gnome Stew Won the Gold ENnie for Best Blog — Thank You! Gnome Stew Won the Silver ENnie for Best Blog! Go Eat The Freakin’ Turkey ALREADY! HackMaster Basic Review Part 2: Combat! Halfway to NYNG 2013: Have You Run Any New Games This Year? Halloween – The Perfect Holiday To Turn Non-Gamers Into Gamers! Happy GM’s Day from the Gnomes! Happy holidays from Gnome Stew! Happy Valentine’s Day From Gnome Stew! Remember when we wrote a romance novel? Have a Very Gnomish Christmas! Have You Ever Padded a Session? Have You Ever Run a Game Outdoors? Hey, if it ain’t the Elven Rangers! How Y’All Doing? Hey, You Wanted to Play the Cleric; Now You’re Stuck with It! Hi, I’m Magesto. Let’s go kill some kobolds! Hot Button – How Much Information Do You Need In Published Scenarios? Hot Button – Player Responsibilities? Hot Button: Do You Want Criticism or Affirmation? Hot Button: Does the Grid Inhibit Roleplay? Hot Button: How Much Feedback Is Too Much? Hot Button: Keep Your Crappy Sci-Fi Out of My Fantasy! Hot Button: Magic – Mechanical or McGuffin? Hot Button: Rolling Dice, A Move too Far? Hot Button: Should Players have an expectation of balance? Hot Button: Show Me the Money! Hot Button: Silent Killers–Interesting Challenges or Unfair Tricks? Hot Button: The Player or the Sheet? Hot Button: What is Your Pet Peeve? Hot Button: What is your Taboo? Hot Button: Who Trumps Who? Hot Button: Who’s Down with OPC? Hot Button: Whose character is it anyway? House Rules: Do You Need One? How Big is that Treasure Hoard? How Common Is Common knowledge? How do You Craft a Good Pitch Session? How Do You Decide What to Handwave? How do You Handle Absent Players? How Do You Learn a New System? How Do You Organize Past Scenarios? How Do You Pitch a New Game to Your Players? How Do You Stay Interested During a Long Break? How Do You Sustain an Epic Campaign? How Do You Use Props? How Important is a Level Playing Field? How Lucky is Your Game? How Much Do You Recycle Between Campaigns? How Much Metagaming is Too Much? How much space do those goblins need? How Much Time do You Spend Engaged with Gaming as a Hobby? With GMing? How Often Would You Like to GM? How Should GMs Learn to GM? How Soon Do You Start Planning Your Next Campaign? I Hate Drawing Maps, but Love Construction Games? Iconic Archetype or Hackneyed Stereotype? Impartial Arbiter, Friendly Guide, or Deadly Foe? Inheriting a Game that You Played In – What To Do With Your Character? Is the D&D Character Builder Changing the Way We Game? Is There Hope for the Worst GMs? Is Your Lucky Die Fair? Itty Bitty Niche Products: How Small is Too Small? 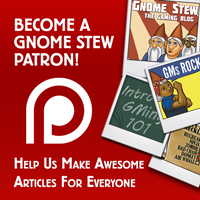 July 24 is the Final Day to Vote for Gnome Stew in the 2011 ENnies! Just how competent are your players? Killer GM or Selfish GM? Last Chance to Vote for Eureka in the Golden Geek Awards! Learn to Say “No” to Your Players. Look, Ma, We Have a GMing Wiki! Looking Back, and a Big Thank You! Looking For GMs? Go To The Tavern Of Course! March Fo(u)rth for GM’s Day 2006! Metal Miniatures: Still Used in RPGs? Mom? Dad? Is that you? More Books, or Fewer Books? More Digest Size Books Please! Most of the Gnomes are at Gen Con — If You See Us, Say Hi! Mouse Guard RPG Review: Want to Play a Mouse with a Sword? My Final Five #2: On the Fly Plots for Narrators! My Final Five: What Articles Should I Write? NBOS Software’s Character Sheet Designer – Nice Tool, Great Price! Need an NPC? How About 19? Never Unprepared: The GM’s Guide to Prep is Now Available for Preorder! New Game Day 2015 is 2/2, and We Want to Give You Prizes! New Game Day giveaway: What did you play on 2/2? New Year’s Eve/Day in Your Campaign? New Year, New Game Challenge: How’s it Going for You? Nine Words That Improve Your Game – What Do You Want To Get Out Of This? Oh God I’m On Fire! Our March of Dimes Charity Auction with Fear the Boot: Win Awesome Stuff! Pick Your Jaws Up Off The Floor…You’ve Been Blindsided! 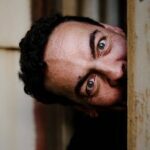 Please Nominate Eureka for the Golden Geek Awards! Please Vote for Gnome Stew and Never Unprepared in the ENnies! Preorder Unframed: The Art of Improvisation for Game Masters Today! Preorders are Now Open for Our Second Book, Masks: 1,000 Memorable NPCs for Any Roleplaying Game! Prep and Running Games: Oil and Water, or PB and J? Ranking Your Favorite Campaigns: What Makes You Tick? Realism? Who needs it? You do! Screw You and Your Facts! Sharknado, the Unofficial Fan Game. Short Sessions: Let’s Get This Party Started! Should Players be Forewarned of Endings? Should We Have a Forum for GMing Questions? So How Was That Game With A Gnome? Social Skills: Evil, Twisted, or Misunderstood? Special Halloween Edition: Turn That Dial To 11! Spotlight Review: Fudge is Tasty! Spring Cleaning – Change The Genre! Super Heroes: the Most Narrative Genre? Sure he’s the Villain, but is he the Bad Guy? Surgery on Gnomes is Expensive! Swords with Attitude aka Can a Sword Pout? Tabletop Forge: Like Google+ Hangout Gaming and PDF GMing Tools? Thank you, Gnome Stew readers! The 7.5 Hit Point Orcish Standard? The Author of Eureka’s Foreword: Monte Cook! The Cover of Our Book, Eureka: 501 Adventure Plots to Inspire Game Masters, Revealed! The Cover of Our Upcoming Book, Masks, Revealed! The GMing Q&A Forum is Live! The Gospel According to Synnibarr: Fun. Is. PAIN. THE ONLINE EDITION: OLD-SCHOOL PARADISE? The Players Just Gutted Your Plans, Now What Do You Do? The Star Wars Arsonist Strikes Back! The Wait Is Over: Masks Is Now in Stock in Softcover! The Witching Hour is upon us! Time to get your witch on, or I’ll witch you in the witch! To Our Readers: Thank You! Treasure Tables Now on WordPress! Troy’s Crock Pot: ‘Ultimate’ NPC generator? Troy’s Crock Pot: Do you errata? Troy’s Crock Pot: Has DC relaunch hit your home game? Troy’s Crock Pot: Indy, why does the floor move? 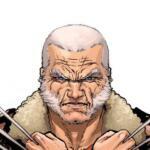 Troy’s Crock Pot: What makes a super villain? Troy’s Crock Pot: What’s in your witch’s cauldron? Troy’s Crock Pot: Why does the dog bark II? Troy’s Crock Pot: Of Robin Hoods and Merry Men! TT Store: Lower Prices on All 42 Items! Twist This: What Kind of RPG Session Can You Make With Santa Claus? Two Kinds of Gaming Group: Which Kind is Yours? Virtual GMs: The Wave of the Future? Wait… Why Exactly Do We Use Hex Maps? Wait? I’m a Stuttering, One-Legged Cheetah? Waiting for the New Character: How Long is too Long? Want to Be an Evil Overlord? 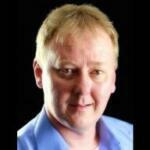 Want to Become a Better Gamemaster? Become a Toastmaster! Want to Become an Editor for Wizards of the Coast? Want to Help Name a Gaming Store? Want to Play a Light RPG with Your Kids? Want to Read Gnome Stew Articles in Chinese? Want to Read the Stew in Russian? Now You Can! Want to Translate Gnome Stew Articles for your Readers? Want to Write about Finding Players and Problem Players? 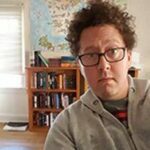 Want to Write for Gnome Stew? Now Accepting Guest Articles! Warhammer Fantasy Roleplay 3rd Edition Unboxing: Gnomish Gnerd-Out! What Are Your Favorite GMing Tools? What Are Your NPC’s AIMS? What Do You do When Your Players are Lost? What do You Expect from Your Players? What Do You Like Least About TT? What Do You Want From a RPG Convention? What Does Your LGS Mean to You as a GM? What ever happened to the seventh son? What GMing Products Would You Like to See? What Goes Behind Your GMing Screen? What Intimidates You as a GM? What Other RPG and GMing Sites Do You Read? What Strikes Fear into Your Players? What The F@#$ Just Happened? What Was Your First GMing Session Like? What Was Your Strangest GMing Experience? 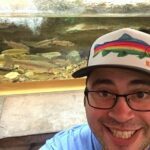 What’s Changed in Your Gaming Life Since Gnome Stew’s First Article? What’s the Longest Campaign You’ve Ever Run? What’s the Longest Session You’ve Ever Run? What’s the Most Significant Thing About an RPG? What’s your favorite way to start a new campaign? What’s Your Secret Campaign Crush? When Should You Use GM Fiat? Where did the Monsters Wander? Where Does The GM’s Fun Come From? Who Will Game With A Gnome? Whose hand swivels the spotlight? Why Are Most Gamers in the U.S. White and Male? Why Do You Love Game Mastering? Why is It So Hard to Find Players? Why Not Just Give It To Them? Worldwide Preorders Now Open for Focal Point: The Complete GM’s Guide to Running Extraordinary Sessions! You … save? ?… a tavern?? You Can Take Our Status as a PC Race, But You Can’t Take Our FREEEEEEDOOOOOMMMM! You May See The Stars, But Do You Recognize The Supporting Cast Members? You Meet In A Tavern’s First Contest!